We, the participants of the Sixth Scientific Forum, appeal to the people of Russia and through them to all Mankind in the hope of being heard by those who want to understand the surrounding world, their place and role in it, who desire positive changes for Russia and humanity, happiness for every person on Earth. During the last quarter of the century scientists repeatedly tried to warn mankind of the danger of self-destruction. In 1992 more than 1700 (one thousand seven hundred) scientists declared that the Nature and human beings were in a state of confrontation and signed “World Scientists' Warning to Humanity”. In 2017 mankind received one more warning of danger, which was signed by more than 15000 (fifteen thousand) scientists of the World. The world scientific community not only raises the alarm but asserts that mankind heads for destabilization and the Earth is in danger of a man-made global disaster. However, the warnings of the scientists have remained unnoticed. Completely supporting the world scientific community concern WE understand that there is no conventional way out of the present crisis. A fundamentally new approach is required which is to accept the mankind’s development paradigm based on new knowledge of the Universe and the role of a human being in it. WE MUST REALIZE THE GREATEST RESPONSIBILITY BEFORE FUTURE GENERATIONS FOR OUR COMMON HOME – THE EARTH, FOR THE EXISTENCE OF HUMAN CIVILISATION! The further fate of the planet completely depends on the goals of the society and the ways of their achievement. Mankind cannot hope for its further being till the achievement of the material welfare at any price is the main aim of the development of the society and a human being, till wealth and social inequality exist, eternal, moral and spiritual values are neglected. Nature is sending us sharp warnings in increasing frequency; the Planet is tired of unwise human activity destroying the environment. At present the fate of the Planet and human beings are in the direct dependence on the views and values that will be chosen by the future generations and according to which they will live. The most important of them are religious, philosophical and ideological views. These are the views of high order for the sake of witch people live and die, the ideas referring to the aim and the meaning of life; that is the trust in God forming the consciousness of a human being and defining his role in the evolution of the Universe. 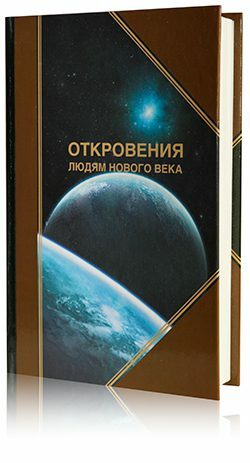 The time has come when people should be given new knowledge of Higher Cosmic Mind (Noosphere, according to Vernadsky), the Universe structure and its eternal inviolable laws, human being’s role and his mission in the Universe. For more than fifteen years, since 2004, the Creator, Higher Cosmic Mind, the Supreme Being has been appealing to people through a person chosen by Him in Russia to stop their running to the abyss of self-destruction! The Knowledge being given by Him explains the aim and meaning of human being’s life on the Planet, shows the way out of the global crisis the people has voluntarily come to, having made false guiding lines and false values as a foundation of their evolution. The basic concept of the Knowledge given by the Creator in the form of “Revelations to the People of the New Century” is the manifestation of absolute unconditional Love for all that exists and the achievement of Social Justice and Equality. The main idea of all the “Revelations” books is the spiritual unity of people of different nationalities and confessions for the purpose of humanity salvation! However at the moment these books are under threat of interdiction. We, the Forum participants, are convinced that Knowledge transmitted by the Creator should become the basis and the guiding line of scientific cognition of the Universe. Today, when humanity is on the verge of self-destructing, nobody has the right to deprive people of Knowledge about themselves, about their nature and their mission! Everyone must understand that he is an integral part of the Universe – the Great Cosmos, and therefore he must live and develop according to the universal laws, that no one is allowed to violate. The Universe is beautiful because there is thinking, intellectual Source that programs, coordinates, creates! The Earth is our common Home, and the task of humanity, as a part of Entire Universal Mind, is to create the Planet of joy and happiness! The text of the Appeal was unanimously approved at the VI All-Russian scientific forum “Matter, Energy, Information”, held on December 8 at the State Central Concert Hall “Russia” in Luzhniki area. Number of voters: 4 020 Forum participants. In order to facilitate the existence of mankind in the Material World, to explain his purpose in this World and to prepare him to meet Me, I am passing on information about the structure of the modern World as well as the structure of the Spiritual World where people will find themselves at the end of their life on Earth. In Revelations, I, God, through My Chosen Person from Russia, My Helper, hope to use modern language to convey information about people’s capacities and the current situation in society on Earth. I am warning people of a possible collapse of society. I am also explaining to people the prospects of building fair social relations and the structure of the Pyramid of Power on the basis of my Knowledge of the Laws of the Spiritual World. Revelations, which are written in the form of My dialogue with the Chosen Person, aim to gradually reveal this knowledge to a wide range of people, who are the architects of their own fortune. The meaning of human life and human potential only becomes clear to people once they understand their vocation in the Material World. In quite a short period of time, everyone who has read Revelations fills their mind with My knowledge and is inspired to develop and improve themselves. This makes life in the Material World easier and prepares people to meet Me at the entrance of the Spiritual World. Fulfillment of at least some of the recommendations and the application of knowledge obtained from reading Revelations will allow people to choose the right path and to understand the meaning of their short life on Earth. In a leap year, which holds symbolic value for humankind, events often occur which change or modify the life-cycle of each person living on Earth. The foundation of the future, which is invisible to us, is laid down in leap years but lies within the power of the Almighty, the Father in Heaven. In the autumn of 2004, absolutely unexpectedly, thoughts began to come into my mind which formed themselves into narratives on topics unfamiliar to me. I continued receiving these “texts” over the next four months and subsequently I formed them into this revelatory Book in which Our Creator directly addresses us, people living on this planet at the beginning of the new millennium. You can find all necessary information about this book in its texts. I have merely prepared the Book for publication, fulfilling the instruction of the Creator and have entitled it: “Revelations to people of the New Century”. While preparing these texts for publication, on the recommendation of the Creator, I removed those words which were addressed directly to me personally, and were related only to my self-improvement process. The ability to fully understand the structure of the world and contiguity with the Creator came to me after participation in a seminar conducted by Karelin Valentin Vladimirovich (now no longer with us). I owe a debt of respect and gratitude to his memory. A Doctor of Technical Sciences, Professor, academician, member of the Presidium and Chairman of the Scientific Council “School Health Technology” in the Russian Academy of Technological Sciences, Academician of the Russian Academy of Natural Sciences, author of over 200 publications in Russian and foreign publications on solid-state physics, financial and banking technology, as well as on the planet’s ecology. (By the time he demonstrated the ability to receive channeled thoughts, L. I. Maslov had already carried out deep scientific research in his position as head of the laboratory of the A. A. Baikov Institute of Metallurgy within the USSR Academy of Sciences, had gained experience of managing financial and industrial structures in the new Russia and the United States, and had worked as an adviser to the Department of Economic Management of the Presidential Administration of the Russian Federation. A further appointment was as adviser to the Chairman of the Board of Gazprombank, including many years of teaching experience in the Corporate Institute of Gazprom and at the Higher School of Economics, a State University. L. I. Maslov also participated in working groups appointed to prepare draft federal laws of the Federation Council of the Federal Assembly of the Russian Federation). When copying materials it is mandatory to make reference to the source site.